It’s a universal truth that burgers and beer are a pairing as classic as peanut butter and jelly. Here at Jack Brown’s Beer & Burger Joint, we’re all about combining classic and creative. Burgers, beer? It sounds like a simple enough combo, right? Well, we prove to you that burgers and beer can be just as exciting as gourmet restaurant cuisine. We start with a 100% Wagyu beef patty (classic), and then let our imaginations run wild with the toppings (creativity to the max). The usual suspects on our Everyday Menu include The Elvis, topped with peanut butter, mayonnaise, bacon and cheese, and The Greg Brady, complete with mac n’ cheese and Martin’s BBQ Potato Chips. Trust us – you just have to try these for yourself. In addition to our exciting regular items, we also feature a different burger for each day of the week. How does a Wagyu-chorizo burger combo topped with beans, corn queso, cheddar and Fritos sound to you? Or try Sunday brunch Jack Brown’s style when you chow down a burger topped with bacon, egg and cheese, all piled between a glazed donut. Now let’s talk beer, because how else are you going to wash down that patty? We offer over 100 craft beers and are constantly changing what we have on tap. There’s always something new to try. From breweries in the far reaching corners of the world to locally sourced beers, you’ll find a world of flavors among our drinks. The Jack Brown’s fun isn’t just limited to the food and drink – your experience when visiting is just as important. Kick back on our shaded porch as you discover new beers, or enjoy our backyard’s games and live music performances. 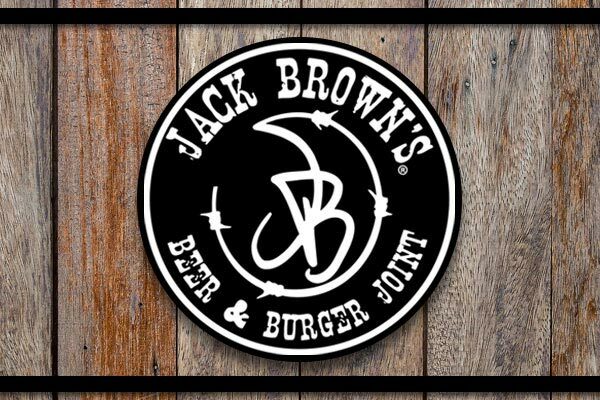 Come be a part of the Jack Brown’s scene!